Work for PTC Creo PLM? Learning about PTC Creo PLM? "Creo - A Great Tool"
Creo is seamlessly integrated with our workspaces and parts can easily be accessed by anyone in the company no matter who actually created the part or when. The application makes it very easy for coworkers to check on parts and combine efforts to design a full product. The application does not work as well on non CAD laptops. I wish there was a better / easier way to use the application of creo without a mouse when taking laptops to meetings to show coworkers parts. This a great tool that can be integrated with windchill to allow access to designs company wide. Creo makes collaboration very easy and is great for designing parts quickly. It is a relatively easy tool that non designers are capable of using without extensive training. Designing parts and integrating subsystems quickly and efficiently. It is very easy to combine work efforts among team members and bring a project together virtually. We have conducted virtual builds with this platform and caught design mistakes or interferences before even producing parts and trying to put them together. "Amazing tool to design 3D Objects"
I am a mechanical engineer. When I completed my graduation, I had a desire to work for a company which offers me an opportunity of a Design Engineer. Although I did not get the chance, the desire to learn 3D Design tool like Creo, CATIA, etc. was always there. It is always a pleasure using Creo. This is something I really enjoy doing..
We can create 3D objects, prepare the assembly drawings and validate them as well. Compared to other design software, Creo is intuitive. Having used PTC since early 2000's Pro/E days, (with a period of using CATIA V5 in that timeframe) - this software is engineer friendly. It's built in such a way that it has ALWAYS had 3D solid modeling functionality, that was easy to translate into 2D drawings. The look is sharp and not cartoonish, its easy to setup to minimize eyestrain, and every iteration has given us big feature improvements. I really wish there was a simpler way to program layouts. A strong understanding of programming language theory is required to use and be good at making this functionality work for us, which limits the users who can modify layouts, and further limits who create layouts as well. PTC has excellent training through PTC University. It is the only software that fully backs itself up with comprehensive useful training and excellent support. There is no point to taking Creo Training that isn't through PTC University - and training can be customized based on how the company customizes their implementation of Creo. This software is ideal in my mind for use in the bearing industry. For our product portfolio, the native design theory jut makes sense. Benefits include creation of layouts and parametric models, which speeds design work due to ability to create great start parts and layouts to build whatever we need. The interaction with Creo with PLM (Windchill) is awesome. As creo and Windchill are both native tools of PTC. It has improved a lot overtime with many enhancements being implemented which came as a request from many end users as ideas/enhancement request . The previous version of creo has some issues with family tables, even that has been solved in the latest versions. I do not have any negative points on Creo PLM. It has developed a functionality that using Creo you can connect Windchill and pull CAD models available inside Windchill server.It also gives a interacting UI embedded inside creo which allows users to push their CAD models inside windchill server and also create virtual parts named as WTPart (Windchill terminology parts) . Which helps during the integration with ERP in maintaining the BOM. Windchill is best suitable for proper documentation, revision control, access control. The best part is how ProE files are well connected with PLM and easy to access. Its a history that the PTC products are robust but they are never user friendly. It takes lot of time to understand the process of using any of PTC software. I work as a design and manufacturing engineer. And we face product changes very frequently. Windchill as a PLM software gives us complete control on the life cycle of the product. 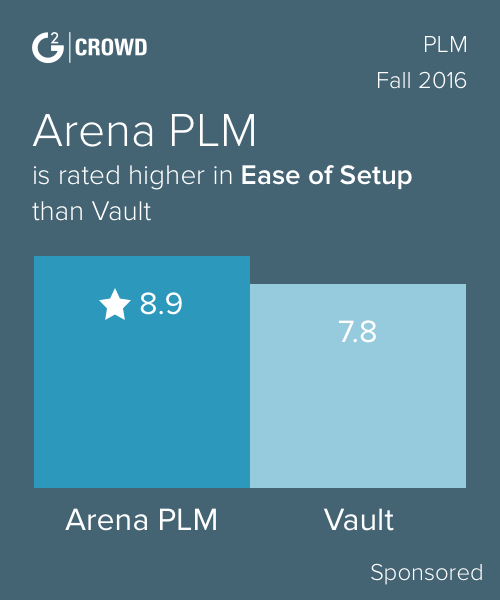 "Ease of use is the biggest strength"
Ease of use on CREO product lifecycle management system its best feature. Users do't require training, they use the tool like a google search and find what they need. Another great thing about CREO how it handles revision control. It allows BOMs and attachments to be archived by revision which allows us to keep a history that is easily accessible. The manufacturer association to the part master is the best I've seen, We like being just one click away from the manufacturer screen on the part that shows the manufacturer name, part number and environmental status. Also, with some very little training super-users can configure the system. Of course, you need IT for mappings, but many of the tasks can be done by the users. The Product & Governance module in CREO needs to be improved to allow multiple specifications to be applied without make the Overall compliance "non-compliant". Another challenge with the tool is the difference between the client application and the web application. While PTC has made great strides over the years there is a disparity in performance and functionality between the apps. It is a great system for the money. Try to use it out of the box as much as possible. While add-ons and customizations are tempting, they make upgrades difficult. "PTC Creo PLM - The best product lifecycle manager"
PTC Creo PLM is a fantastic software that is great for all companies, large or small, looking to monitor their products and determine the lifecycle of them. PTC Creo PLM is a bit hard to use, but once you get used to it, its a great product with awesome features. "Used for reviewing board files, opted for less expensive viewer option"
This was a great tool for developing in, but as a EE we used it primarily to review board files. This made the PTC Creo View a better option. My dislikes are not fair to the product since I was really only using it as a viewer. It did not fit my needs as well as the PRC Creo Viewer. It’s the best software for design. I like all the auxiliary applications like sheet metal, harness, fluid lines, simulation etc. It’s a friendly user CAD tool. There is nothing to be unliked but sometimes crashes opening big files and tesselating JT. am designing components. benefits are it’s friendly user, takes less time and all the products can be designed as per standards. "Using PTC Creo PLM for all Product design & sustaining engineering needs"
Too pricey and bulky. It is having the concept of top down modelling which sometimes becomes a constraint during the early stages of product development & prototype phase. Product design, ECN, ECR, product changes & sustenance, model, 2D drawing data. * We monitor all PTC Creo PLM reviews to prevent fraudulent reviews and keep review quality high. We do not post reviews by company employees or direct competitors. Validated reviews require the user to submit a screenshot of the product containing their user ID, in order to verify a user is an actual user of the product. Hi there! Are you looking to implement a solution like PTC Creo PLM?